ABOUT MYNA: MYNA is dedicated for youth, and managed by youth. Join us for empowering lectures, hands-on workshops, hours of ice-breakers, zip-lining, canoeing, hiking, archery, bonfires, and more! 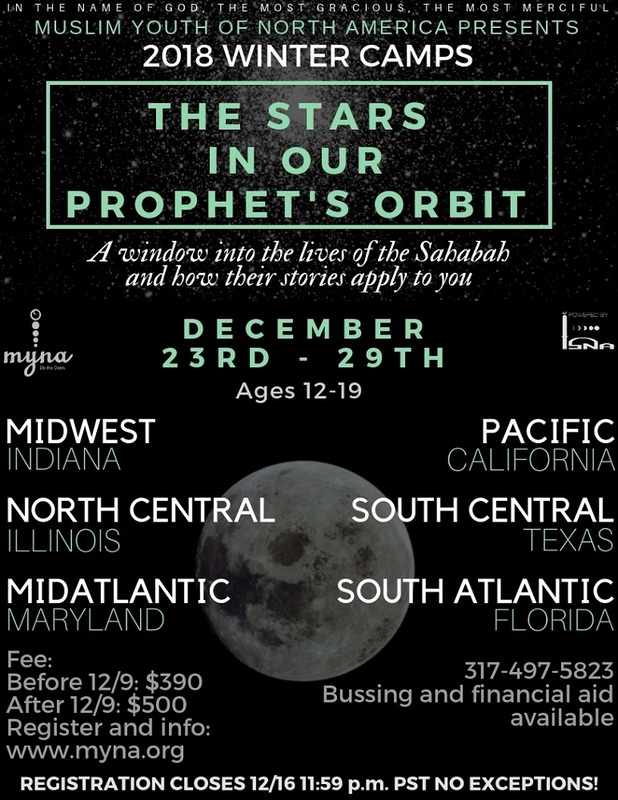 HOW MUCH: Register at MYNA.ORG before 12/9 and pay just $390. After 12/9, prices will increase to $500. THEME: In the era of a new message, the time when Islam was first introduced, they were the Prophet Muhammad’s (PBUH) greatest companions. In every state of Islam––the trials and the successes, the defeats and the victories––they were the people who showed great strength of unity and fearlessness in the way of Allah (SWT). They were the people who firmly stood with our beloved Prophet (PBUH), who laid their lives for the prosperity of this divine message. They were the stars in our Prophet’s orbit. And they are the lives and legacies that will be explored this winter. Next → Next post: Don’t Forget to Vote!